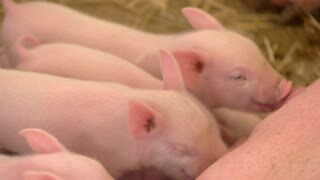 Piggies drink milk from sow. 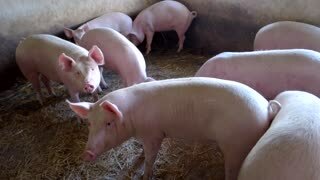 Group of little pigs. Breeding of livestock at farm. Hogs grown for meat. Piglets lying on straw. 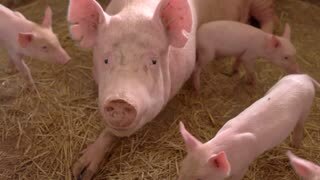 Pigs near a sow. Piggies sleeping in the barn. Animals live on a schedule. 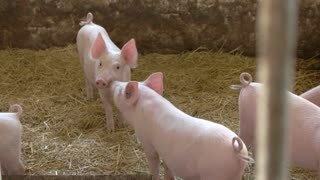 Group of pink pigs. Animals stand on straw. Hungry piggies waiting for food. Farm sells livestock. 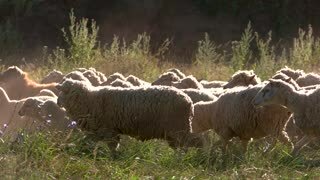 Sheep herd is walking. Animals on grassland. Good conditions for breeding livestock. Pasture in rural area. 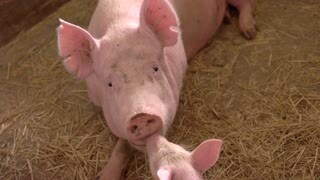 Pigs drinking milk from sow. 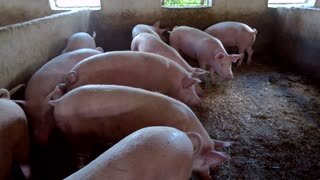 Small hogs of pink color. The three little piggies. Animals must get enough food. Pig lies on yellow straw. 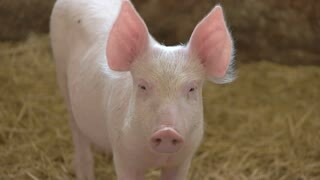 Piglets are walking around. Sow in the barn. Animals grown for commercial purpose.